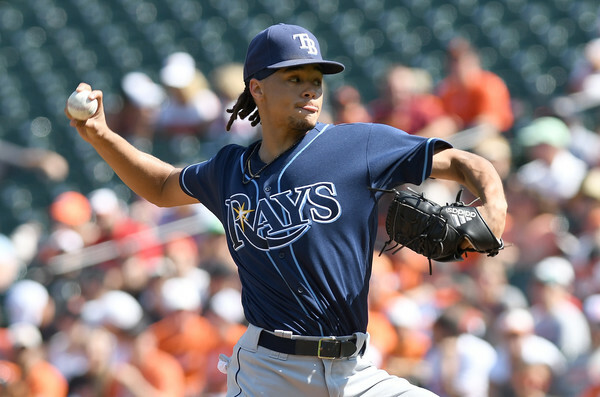 The Tampa Bay Rays are going all in on the rebuild and shedding salaries, with Chris Archer also on the trading block. The St. Louis Cardinals, Philadelphia Phillies, Washington Nationals and Minnesota Twins are all showing interest in the all-star righty. The Rays have already traded perhaps the biggest name ever on their roster, Evan Longoria, to the San Francisco Giants this offseason; Archer seems to be another piece of the puzzle for a team looking to cut costs and stock up on prospects. Archer made the All-Star game for the second time in his career last season, and while his ERA was a slightly disappointing 4.07 in 2017 (4.02 in 2016, 3.23 in 2015), he improved his SO/W ratio significantly: from 3.48 in 2016 to 4.15 in 2017, the best of his career. He’s also stayed healthy, starting in 32 games or more over each of the last 4 seasons and pitching over 200 innings in each of the last 3 seasons. Last season Archer also had his first career hit (two of them actually), posting a .250 batting average. The Rays aren’t forced to make this move: They might want to shed salaries, but his deal isn’t a cumbersome one, making him such a catch on the trade market. He’ll make $6.4 million in 2018 and $7.6 million in 2019 before team options kick in: a $9 million team option in 2020 with a $1.75 million buyout, followed by a $11 million team option in 2021, with a $250,000 buyout. Even if Archer fails to deliver the good on his next team, it’s not a deal that lock up a team for a number of years.